Not an everyday soap but one to give as a gift or if you are lucky to receive as a gift. Mine came from a luxury hotel and I felt like a queen while there with all my L'Occitane products.This soap was so gentle and creamy yet the smell was fresh and equally popular with me and my husband as it is a unisex fragrance. I brought so many of these home for gifts but did keep a couple and I now wish I had kept them all. Not tested on animals and a truly luxury product from packaging to the scent and feel in use. A really beautifully presented package and the soap inside smells wonderfully lemony just like the lemon balm in my garden. I love the smell of this soap and the quality is fantastic. The packaging looks really expensive and classy. The bar is also a decent size so great value for money. I love everytything about it,the lather is rich and creamy and feels good on the skin,really moisturising and luxurious. skin was left feeling soft and moisturised,a fantastic quality soap,one of the best i have ever used. 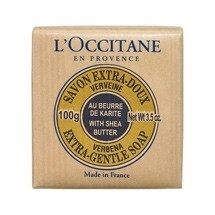 I bought myself a bar of this recently as I really wanted to try the soap after smelling it a while back. The scent is quite strong, I really like it. I like the packaging, thick paper wrapped around the bar. Easy to use, lathers really well. Leaves skin really soft and moisturised, nothing like the usual soaps. "Not an everyday soap but one to give as a gift or if you are lucky to receive as a gift. Mine came from a..."